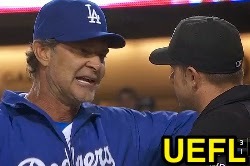 HP Umpire Will Little ejected Dodgers Manager Don Mattingly for arguing a strike two call in the bottom of the 6th inning of the Giants-Dodgers game. With one out and none on, Dodgers batter Hanley Ramirez took a 1-1 slider from Giants pitcher Madison Bumgarner for a called second strike. Replays indicate the pitch was located over the outer half of home plate and at the midpoint between the top of the pants and uniform shirt (px .210, pz 3.521 / sz_bot 3.480 [MOE 3.563]), the call was correct. At the time of the ejection, the Giants were leading, 3-1. The Giants ultimately won the contest, 3-1. This is Will Little (93)'s first ejection of the 2014 MLB Regular Season. Will Little now has 7 points in the UEFL Standings (2 Previous + 3 AAA + 2 Correct Call = 7). Crew Chief Ted Barrett now has 2 points in the UEFL's Crew Division (1 Previous + 1 Correct = 2). This is the 37th ejection of the 2014 MLB Regular Season. This is the 14th Manager ejection of the 2014 MLB Regular Season. This is the Dodgers' 2nd ejection of 2014, T-1st in the NL West (LAD, SF 2; SD 1; ARI, COL 0). This is Don Mattingly's first ejection since August 2, 2013 (Alan Porter; QOC = N [Balls/Strikes]). This is Will Little's first ejection since August 31, 2013 (Ned Yost; QOC = N [Balls/Strikes]).